Style extends from the straight lines of the square back to the rounded, extra cushioned arms that are highlighted with contrasting cording. Comfort is not sacrificed by style. With a hidden inside handle, this gem reclines to a full layout position. The semi-attached back is blown with high-loft premium cushioning fibers, while the seat utilizes a high-density foam cushion for maximum resiliency. We'll specially make a sofa or chair in the fabrics you want. 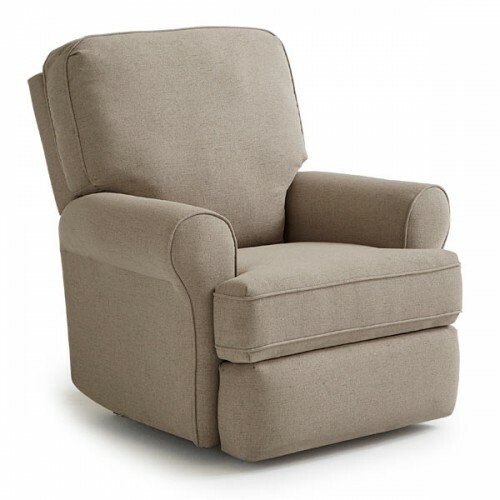 This recliner is available as a Wallhugger, Power Wallhugger, Swivel Glider, Rocker Recliner or Power Rocker Recliner.